I’ve finally lived to see it: a mass of happy Russians, smiling, friendly, relaxed and at ease. Of course, they weren’t in Russia. In Goa, a former Portuguese colony on the west coast of India, Russians are discovering another, gentler way of being. As if on another planet, they’ve started to love themselves. Or perhaps it’s just that they’re on holiday, having a high old time. But the great thing is these vacationers are not rich; not super-rich, anyway. Ordinary Russians can afford a package getaway to Goa in January. Small business people, who can run their affairs from a laptop on the beach as easily as from an office in Moscow, are staying, in some cases, for the whole winter. They are renting old, Portuguese villas and living as at the dacha until the season turns—the monsoon comes to India and the sun returns to Russia—and real dacha life resumes in the wooden cottages of the Moscow region. This year, in particular, Goa was crowded with Russians because the revolution in Egypt sent tourists looking for alternative warm destinations. 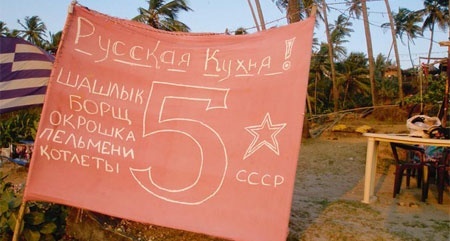 On the 23 February, masses of Russians, including many from the military, celebrated Russian Army Day with cocktails at sunset on Baga Beach. “Morning, morning, good morning,” the guests greeted each other as they went to the breakfast room. Casually dressed, they spoke softly among themselves and it was hard to catch which language they were speaking: English, German, Russian? They were mostly Russian, in fact. “My friend, my friend!” called out one Russian to the waiter. He had a problem. He wanted giant prawns for breakfast but lacked the English to order them. The waiter lacked the Russian to explain to him that it was a set breakfast: eggs boiled, fried, scrambled or poached, toast and jam, tea or coffee. The Russians can be quite rude,” the waiter said to me in an undertone. “No, no, it’s just the language barrier,” I said, offering to translate. The guest, who turned out to be called Volodya, a driver from Moscow region, didn’t understand why, if he’d enjoyed giant prawns the previous evening, he couldn’t have them again for breakfast. I explained and he embraced me like a long-lost friend, an Englishwoman who spoke Russian. The waiter was equally surprised and roped me in to giving a crash course in Russian to all the waiters, so they could communicate better: zavtra = tomorrow; zavtrak = breakfast etc. “Fancy a ride on the back on my scooter?” suggested Kolya after breakfast, so I let him take me along palm-fringed roads to nearby Vagator Beach, where he left me to walk, swim and sunbathe. In front of the beach huts were rows of sun loungers, patrolled by Indians offering fresh fruit and bright sarongs. Behind the beach huts, I gathered, a fair amount of marijuana smoking was going on. No wonder everyone was so happy. 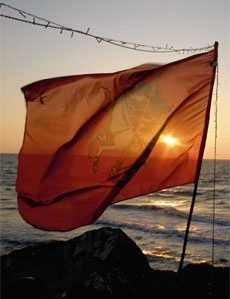 Down the beach, I spotted a red flag but it wasn’t warning of dangerous currents. It was the flag of St. George, ensign of Moscow, advertising Restaurant Five, which offered borsh, pelmeni and okroshka to homesick Russians fed up with the spicy Indian diet. The cafe was run by Margarita and Sasha Kuznetsova who, with help from local partners, had managed to take on the business for the season. They were doing a roaring trade, selling cocktails to tourists from Tyumen. “This beats winter in Siberia,” laughed one of the drinkers. The most amazing thing was that the only public toilet on the entire beach—and clean it was too—was provided by these Russians. We had a good laugh about that. Over the next few days, I hung out with the Russian tusovka crowd. There was some serious drug-taking going on and not only marijuana. This wasn’t quite my scene but Russian Goa had other attractions to offer. On Saturday, everyone said, I had to go to the night market, with all the latest tropical fashions. It was abuzz with Russians buying clothes and souvenirs but I also discovered a community of near-resident Russians, who live by selling their crafts to the tourists. Masha and her boyfriend, who sell paintings, invited me for a meal at their rented house and it was like going to the dacha in Moscow region on a summer evening. The only problem was that from time to time, they had to leave India to renew their visas. “We just go to Thailand and then come back in again,” they said. I reflected that back in the 1990s the rabid nationalist politician Vladimir Zhirinovsky predicted that Russian soldiers would “wash their boots in the warm waters of the Indian Ocean”. He turns out to have been right—but in the nicest possible way.